Figure 3. The Beaufort Gyre. See it in action in Figs.4 and 5. See also the National Snow and Ice Data Center (NSIDC) description. As Fig. 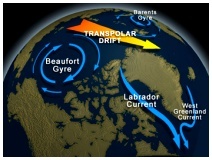 4 below shows, this seems to be exactly what happened in April this year (2013) – the wind-driven currents of the Beaufort Gyre grabbed hold of the edge of the thick band of multiyear ice that persists north of the Central Canadian Arctic and spun some of it south into the Eastern Beaufort. Figure 4. Ice thickness in the Arctic, as of April 27, 2013 (produced by the US Navy). Notice that some of the thickest ice (yellow and red, 3.5-4.5m thick) is curling towards the Eastern Beaufort/Yukon shoreline and western Banks Island (pink square). But look at what happened in 2011 (Fig. 5) – some of the ice that spiraled into the Eastern Beaufort (around “140W” on the maps) was 5m thick and most of it was 3.5 to 4.5m thick! This sequence of ice thickness maps, from early March through late April 2011, shows how the multiyear ice moved south. Figure 5. 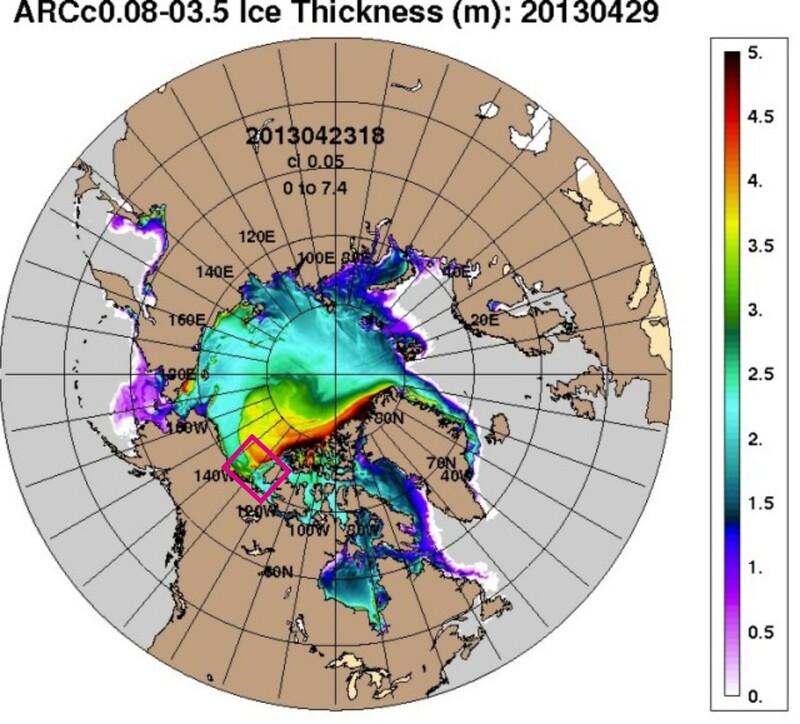 Ice thickness in the Arctic, the spring of 2011. Top to bottom: March 3, March 20, April 2, April 30 (2011). That bit of black you see in the tongue of multiyear ice (red and yellow) curling towards the shoreline of the Eastern Beaufort/Yukon (around “140W” on the maps) is ice that is 5 m thick! Note that these maps have only been available since 2011, see the Navy NRLSSC archive here). Click to enlarge. Eventually, it seems to me, the thick multiyear ice being driven south by the wind-driven currents of the Beaufort Gyre compress the shorefast ice (which develops along the shallow coast of the continental shelf over the winter, 20 km wide in places, see Fig. 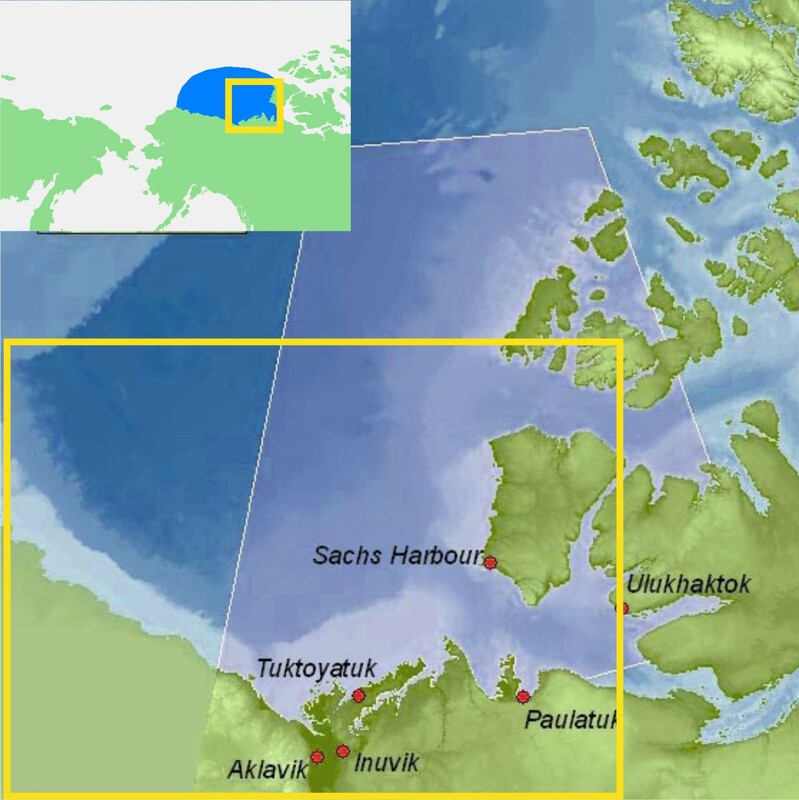 1) against the Eastern Beaufort/Yukon mainland coast and the west coast of Banks Island. Under the most extreme of these conditions, the shorefast ice becomes very thick, with fields of buckled ice and pressure ridges (see Fig. 2). These conditions make it difficult, if not impossible, for ringed seals to maintain their breathing holes: they have little choice but to move elsewhere, or perish. I’ll deal with the proposed decadal-scale downturn in seal populations another time. But there was indeed a particularly severe storm in early 2005 (from the 9th to the 12th of January – which Melling (2005) called a “storm of the century” and Stirling et al. (2008) called a “once-in-50-years storm”) – and a few months later (in April) polar bear biologists encountered extensive “rubble fields” of thick, compressed ice and some bears in poor condition. However, Steve Amstrup and colleagues (2006) also found bears in poor condition in early 2004 – the spring before this huge storm – when they blamed the poor condition of the bears they captured for the three incidents of cannibalism they recorded (previous post here). Work by Lois Harwood and colleagues confirm that ringed seals were also having trouble in 2004, the year before this mega-storm occurred (Harwood et al. 2012). So, is it storms (with winds from the northwest) that cause the thick ice – or bouts of multiyear ice being transported onto the coast by the wind-driven currents of the ever-present Beaufort Gyre? Or some years, a bit of both? There is no discussion of the role of the Beaufort Gyre that I could find in any of these papers describing Beaufort Sea storms and their effect on shorefast ice thickness in the critical late winter-through spring months. Given this knowledge, why would these authors consider the event of the 2000s (2004-2006) as significantly different from previous events – different enough to blame the latest one on global warming but not the previous ones? There’s one historical perspective that’s especially useful. Ice thickness maps were produced in the early 1970s by the research team lead by Rene Ramseier (Ramseier et al. 1975) from Nimbus 5 passive microwave data. It appears to me, from these maps, that something similar to the spring of 2011 occurred during 1974 and 1975. Recall that 1974 was a very bad year for ringed seals and polar bears in this region, discussed previous here. The maps below (Fig. 6) are from the Ramseier et al. report and they show the percentage of first year ice relative to multiyear ice (solid white areas on the maps) in February and March 1974, and January and March 1975. You can see the multiyear ice extend like a tongue down towards the Eastern Beaufort/Yukon mainland coast and also pushing against the west coast of Banks Island – both regions of extensive polar bear research at the time. Figure 6. Ice thickness maps from Ramseier et al. 1975. The multiyear ice (white areas) seem to have impacted the west coast of Banks Island severely in the springs of both 1974 and 1975, while the coast of the Eastern Beaufort/Yukon mainland in the south may have been more severely impacted in 1975. Most of the sampling of polar bears in the 1970s occurred around Banks Island, with some along the Eastern Beaufort/Yukon coastline. It appears to me that every few years in the first half of every decade, the amount of multiyear ice that is transported into the Eastern Beaufort in late winter and early spring by the Beaufort Gyre is greater than usual. 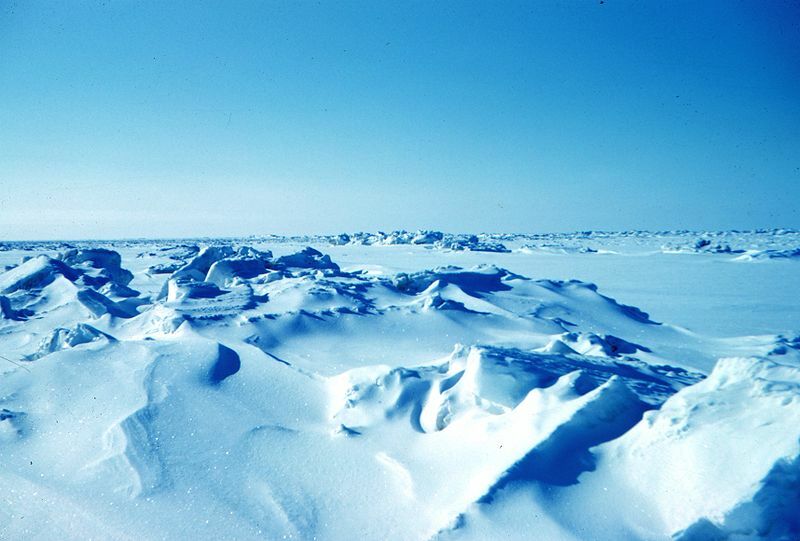 Greater-than-usual amounts of multiyear ice compress the shorefast ice into a greater-than-usual thickness, which is unsuitable for ringed seals and consequently, devastating for polar bears. Storms may play a small role but it seems unlikely storms by themselves explain the phenomenon. 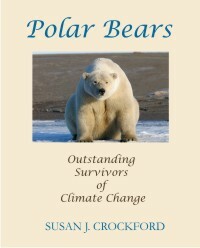 Finally, a few words about 2011 – was there an impact on ringed seals and polar bears as severe as 1974 or 1975? While there have been no reports that I know of that suggest polar bears in the Eastern Beaufort had a hard time in the spring of 2011 because of the onshore movement of multiyear ice, the reality is we may never know. That’s because polar bear research efforts are now so focused on finding negative impacts of changes in summer sea ice extent that little, if any, work is being done in the critical spring period (Fish & Wildlife Service 2009; Polar Bear News 2010; Regehr et al. 2010; Rode and Regehr 2010). How convenient – devastating impacts of thick spring ice (e.g. starving polar bears due to declines in ringed seals) will now likely be attributed to ‘effects of climate warming’ (i.e. reduced sea ice extent in late summer/early fall) simply because any bears in poor condition in the spring will likely remain in poor condition through the summer. Voilà! Poor condition correlates with reduced summer ice! However, it is likely there will continue to be research on ringed seals in spring and early summer around Banks Island (e.g. Harwood et al. 2012), which will give us some way to track the phenomenon. 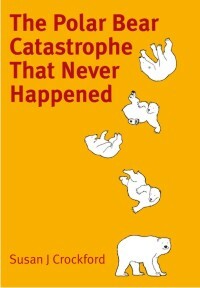 More on the impacts of this phenomenon on polar bear population numbers in my next post. Amstrup, S.C., Stirling, I., Smith, T.S., Perham, C. and Thiemann, B.W. 2006. Recent observations of intraspecific predation and cannibalism among polar bears in the Southern Beaufort Sea. Polar Biology 29:997–1002. Pdf here. Mahoney, A.R. 2012. Sea ice conditions in the Chukchi and Beaufort Seas. 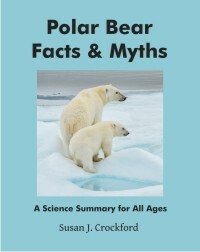 Pamphlet prepared for The Pew Charitable Trusts’ U.S. Arctic Program. Pdf here. Melling, H. 2005. Sea ice, climate and Beaufort development. Presentation at the PERD/INAC Workshop, 1-3 November, Inuvik. “Northern Oil & Gas Research & Development in the Beaufort Sea.” Pdf available here. This entry was posted in Life History, Sea ice habitat and tagged Arctic storms, Banks Island, Beaufort Gyre, Eastern Beaufort, Harwood, heavy sea ice, ice thickness, Melling, multiyear ice, pressure ridges, Ramseier, ringed seals, shorefast ice, spring ice conditions, Stirling, Vibe. Bookmark the permalink.